Happy Hollow Rd-Bridge 281-Section 3- Madison Twp – Bridge closed due to flood damage – Permanent closure. Not scheduled for replacement. 233rd Ave-Bridge #294-Sec. 36-Madison Twp – road closed indefinitely due to bridge closure, between Town Line Rd and Dry Run Rd. Not scheduled for replacement. 150th St.-Bridge 192-Section 8-Washington Twp just north of Ft. Atkinson – Bridge closed by Ft. Atkinson Park. Permanent closure until bridge can be replaced. Ice Cave Rd. at Ice Cave. Closed due to roadway instability. Road closed indefinitely. 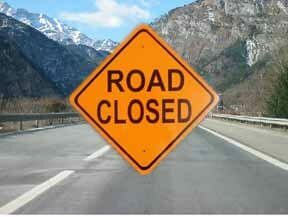 360th Street-Bridge #376 closed in Highland Township, Section 23, due to deteriorated condition. Permanent closure until bridge can be replaced. Chimney Rock Rd-Section 5 of Bluffton Township, Bridge #347, due to flood damage. Permanent closure until bridge can be replaced. Cattle Creek Rd-Section 6 of Bluffton Township, Bridge #348, due to fallen bridge. Scenic River Rd-Bridge #354 closed in Bluffton Township, Section 25, due to advanced deterioration. Closed until repaired.